Recipe: Easy Banana Nut Bread made with Bisquick – Something's Burning……. Ran across this photo last night. 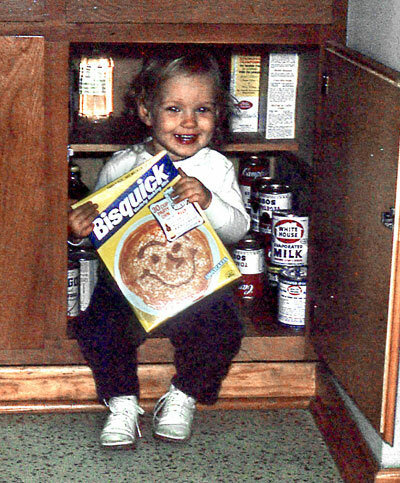 Apparently, I liked hiding in the cabinets and rummaging through dry goods as a child. I was probably hiding from My Three Brothers. While I can’t fit into the cabinets any longer, I still rummage through the pantry so see “what can I make with this stuff” as I hate wasting anything. Give it a whirl! It is a time saver and really, really, REALLY easy. Heat oven to 350°. Generously grease the bottom of a 9 X 5 X 3″ loaf pan. mix all ingredients and beat vigorously for one minute. Pour into the greased pan. Bake for 55 to 60 minutes or until wooden toothpick inserted in center comes out clean. Cool for 5 minutes on cake rack. Run knife around sides of loaf and remove from pan. Previous Post Men ARE from Mars! Next Post Sure fire method for never being invited to church! You should enter this recipe for the Banana Bread bake off. I have links to it on my site. Cute picture! A house without Bisquick in the cabinet might as well be a house without a kitchen. My mother used it, and I keep it for lots of things. In fact, the first batch of chicken-n-dumplings I ever made were from bisquick. That’s a cute photo !